Ryan says that the research design looks solid and the results, though still preliminary, are encouraging. I’d add that it’s also encouraging to see these kinds of results in middle schools. Quite often, charter schools show good results in elementary schools but those results end up washing out in later grades. High school is still the acid test, but it’s nonetheless good news to see that KIPP is showing steady good results beyond just the primary grades. But there’s always a “but,” isn’t there? And there are a couple of them here. 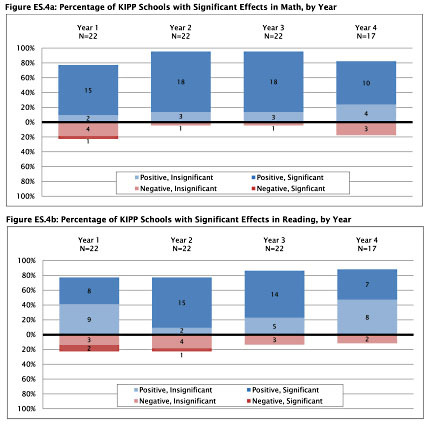 First, although this study design is solid — it compares kids who got into KIPP schools via lottery with kids who applied but didn’t get in — it’s still the case that these are kids who applied to KIPP schools. All by itself that means they and their parents are part of the upper fraction who care about education and are willing to put in the work that KIPP demands of families. That’s a limited set. Second, there aren’t very many KIPP schools, and their structure is a built-in reason for this: KIPP schools demand a lot of their teachers, who work very long hours and are required to be on call at all times. They pay a bit more for this, but only a bit, and this isn’t a model that scales well. You can always find a small cadre of dedicated young teachers willing to put up with this, but you’re never going to find the hundreds of thousands you’d need to make this work on a large scale. That’s not to say that KIPP is a failure. It’s not. It’s a success. But it’s a limited one, and probably always will be.